So, you are getting ready for dental implants. That’s great! But, how familiar are you with the procedure involved in dental implants? Surprisingly, some may be aware of it & some may not. For those who are not conversant with the procedure involved in cheap dental implants in Melbourne, this blog will provide you an insight on dental implants. Let’s take a glance on the procedure involved in dental implants. It begins with removing damaged teeth. Patients are getting ready for bone grafting just to prepare the jawbone to proceed with surgery. Surgeon places dental implant metal post in the jawbone, once your jawbone is healed from the damage. You need to go through a healing period after fixing metal post that lasts several months. Surgeon places abutment as the extension of implant metal post. Surgeon will make moulds of your teeth while your soft tissue heals. At the end of the process, surgeon places the final artificial tooth or teeth. The entire process typically takes months from start to finish, as a significant time is required for the new bone to grow. Surgeon begins the dental implants procedure by cutting the spot to open the gum & expose the bone. The area is drilled into the bone to place metal post inside. Surgeon makes sure the holes are drilled deep enough to place the metal post as it is going to work as the tooth root. Even after placing metal post in the bone, the tooth is still missing. This is when a partial or temporary denture will be placed. You can easily remove the denture anytime for cleaning or while sleeping. You have two options in choosing the right artificial teeth for you. You or your dentists can choose either removable, fixed or combination of both. 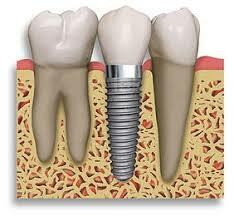 You can consult with a dentist about dental implants cost in Melbourne. As the name suggests, it can be easily removed by you, which is similar to conventional removable denture. It looks as natural white teeth surrounded by pink plastic gum. It can be easily removed for repair and daily cleaning. Another type of artificial teeth is fixed teeth, which doesn’t allow you to remove it for cleaning. You can opt this to replace several missing teeth in this way, if affordability is not a big concern. You can get fixed with a set of teeth by one implant if they are bridged together. Anyone who feels discomfort with damaged teeth can contact a dentist, as the cost of dental implants in Melbourne is very reasonable. After the procedure is done with, you may need to eat soft food while implant site heals. Contact your dentist, if you confront swelling or discomfort caused by implant surgery.